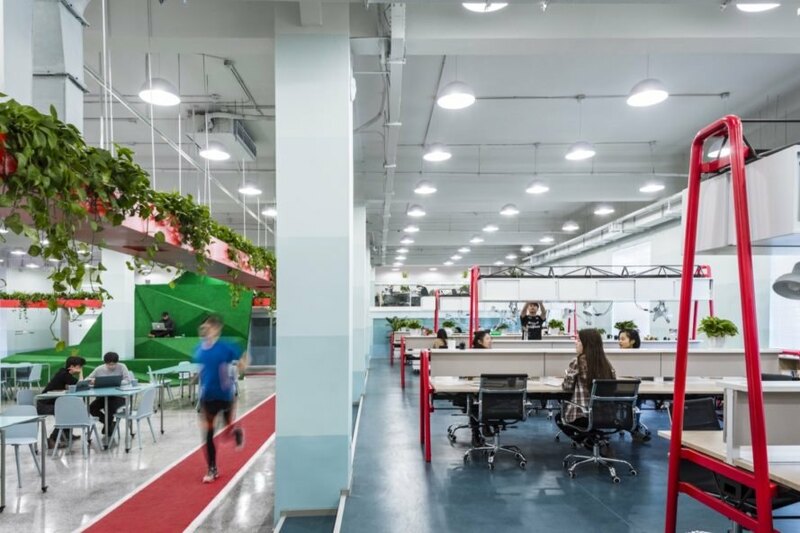 A running track, elevated hydroponic gardens and a miniature “mountain” combine in this fun, new office headquarters for the non-profit Leping Foundation in Beijing, China. 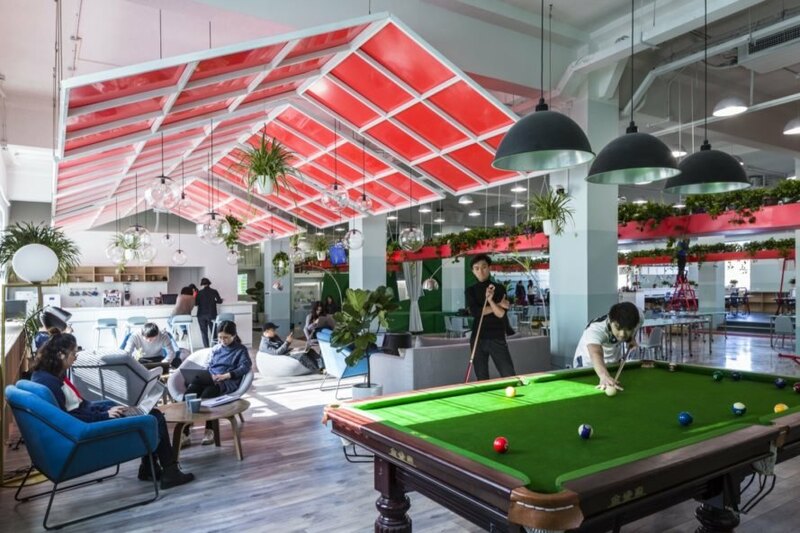 Designed by the prolific local design practice People’s Architecture Office (PAO), the mostly open-plan office landscape was created to foster health and wellness. 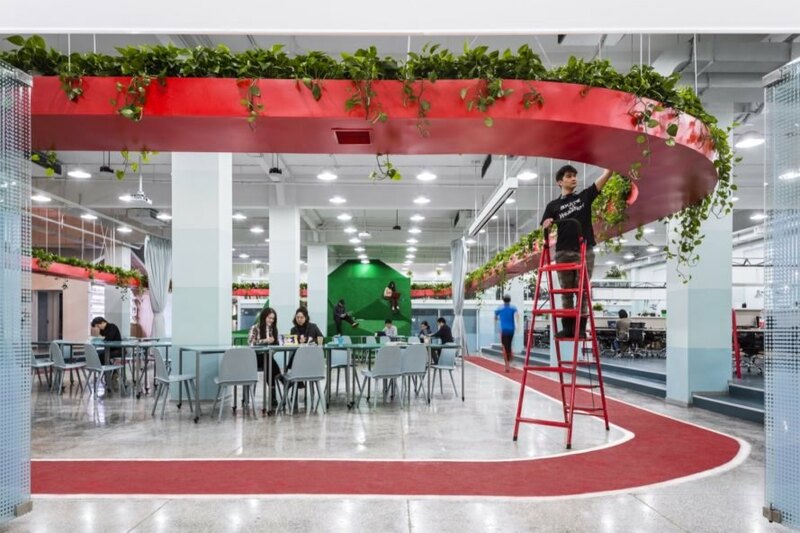 Covering an area of 1,100 square meters, the Leping Social Entrepreneur Foundation Headquarters unites four of the company’s departments with a suspended vegetated loop and a running track underneath. 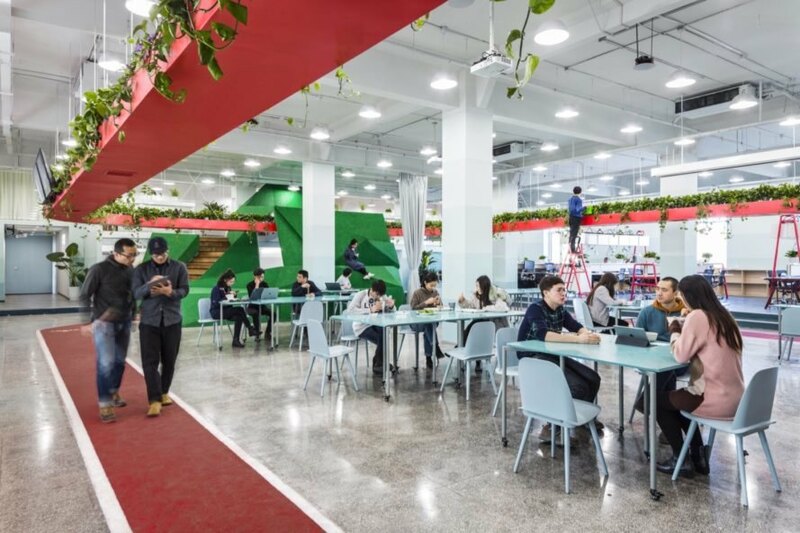 Known for its social innovation work, the headquarters of the Leping Foundation covers four distinct fields: job training for migrant workers, agricultural research, preschool education and microfinance. To cultivate a sense of community among the different fields, the People’s Architecture Office created an office that fosters collaboration and interaction. 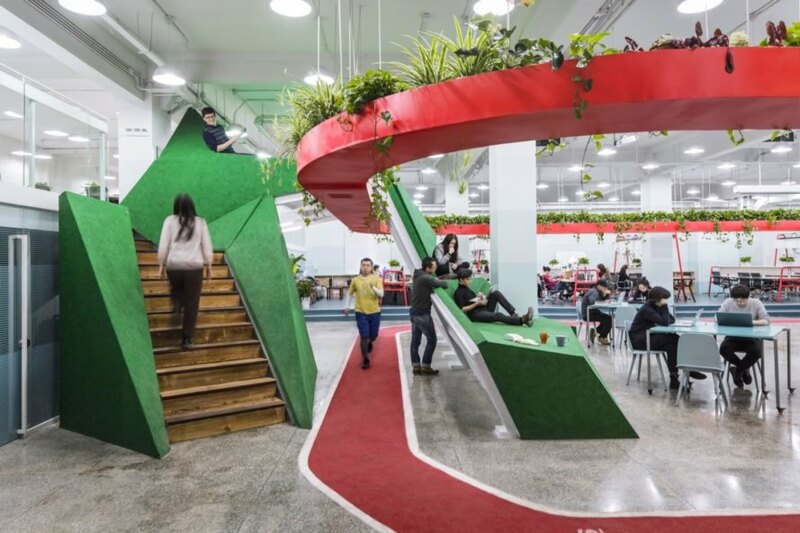 The activity loop track that snakes through the various departments encourages office workers to take breaks and walk laps around the office. 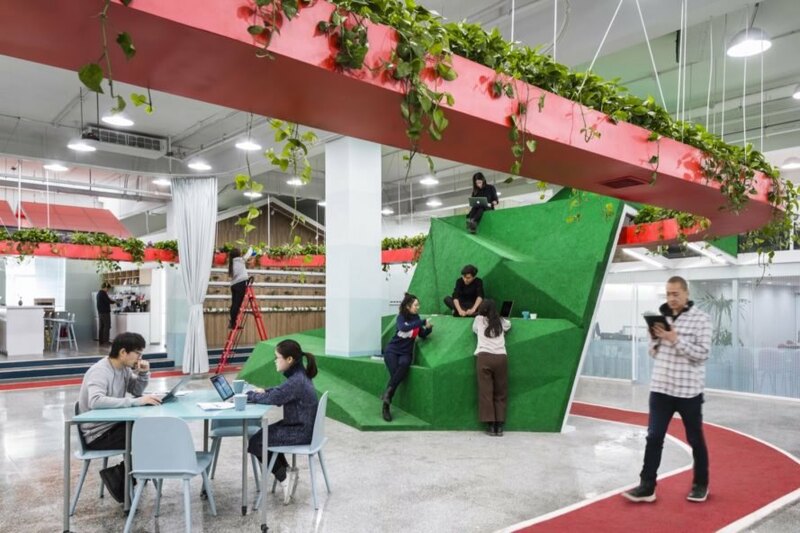 In addition to the open kitchen, dining area and lounge, the architects also added a “mini mountain” integrated with stairs to give workers a way to “hike” up to the mezzanine level. The office also includes a separate gym, a meditation space and a meeting room. The suspended hydroponic gardens that are filled with edible plants and aromatic herbs not only add beauty and a source of food for the office, but they also help clean the indoor air. The gardens are complemented with an advanced air filtration system — an important addition given Beijing’s notoriety for severe air pollution. Indoor air quality data is regularly collected, monitored and displayed in real time above the running track. This vibrant office is headquarters for the non-profit Leping Foundation. The office was designed by People's Architecture Office. The headquarters are located in Beijing. 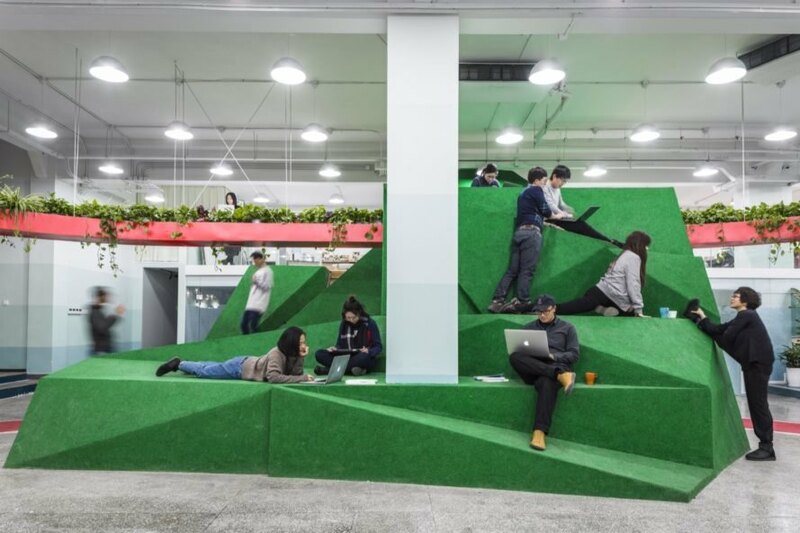 A "mini mountain" allows workers to rest or get active. Almost the entire building is an open-layout. The office caters to the "work hard, play hard" mentality. On the mountain, workers are encouraged to lie down, sit, stand or climb. Bright open spaces make it comfortable to work. A running track loops around the office, further encouraging physical activity. Above the track, hydroponic gardens improve indoor air quality. The gardens are planted with edible and aromatic plants. The office also features quieter spaces for focus. The space fosters collaboration and communication. Leping Foundation covers four distinct fields: job training for migrant workers, agricultural research, preschool education and microfinance. 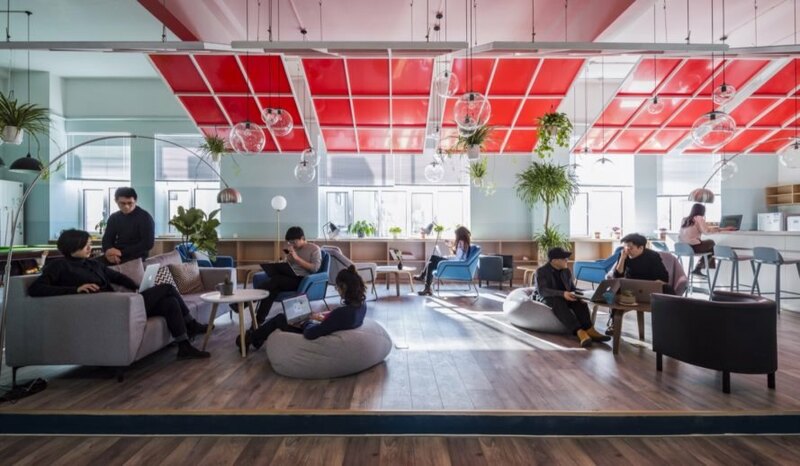 The entire space is meant to boost employee health and wellness.